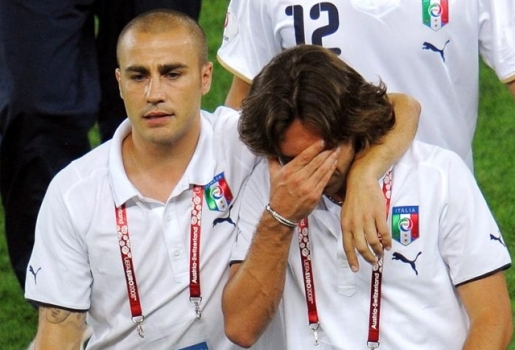 Italy & Milan midfield playmaker, Andrea Pirlo, was heartbroken after Italy's EURO 2008 quarter final game against Spain. Such was the heartache & shame felt by a player who was obviously a missing element in the team during the game. He couldn't play because he was suspended for having a total of 2 yellow cards in his previous games. Italy lost in a game that they played very badly. Spain worked hard & were constantly looking to score against the Italians. Italian goalkeeper Buffon was probably the best performing Italian player on the pitch that night. The game ended 0-0 with Spain deservingly winning 4-2 in penalties.